Another type of filter used in water filtration is the cartridge filter which is generally used for lower rates. The filter vessels are built to hold a number of cartridges of various microns sizes and to handle desired flows. The water passes over several filter sizes to trap particulate solids and allows the clean water to continue through the system. Like bag filters, cartridge filters are used to remove contaminants, depending on your application. The filter media in a cartridge may include a wide range from sand, anthracite, and quartz to conditioned media for iron and manganese removal, and activated carbon. 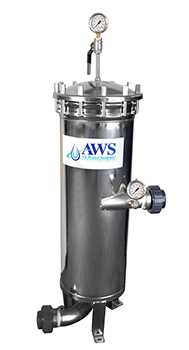 All Water Systems provides assistance in selecting the correct cartridge filter for your water purification system. Our over 30 years of experience with water filtration systems in most every market and industry helps us help you maintain your entire system from cartridge filters to service to monitoring your water usage and application needs. We also offer a complete line of housing units specifically designed for cartridge filters, manufactured from carbon steel or stainless steel depending upon your requirements. For More Information on cartridge filters for water, call (412) 824-6560, or click here to contact us.